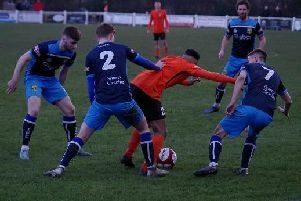 Tadcaster Albion got themselves back within touching distance of the Evo-Stik Division One North play-off places with a last-gasp victory at fellow promotion hopefuls, Glossop North End. An injury-time winner from substitute Adam Baker saw Michael Morton’s men defeat the home side’s 10 men, moving them up to ninth position in the league standings, just three points behind sixth-placed North End. On a nippy afternoon in the Peak District, Albion should have been ahead after just three minutes, but Aiden Savory couldn’t beat goalkeeper Paul Phillips after being slid clean through on goal. The Brewers continued to press for an early lead and almost took it following some hesitation in the home defence. A short header back gave Tom Corner the chance to chase and the Brewers’ top scorer nipped in ahead of gloveman Phillips, only to prod over the bar. Then, a minute later, came the moment that changed the game as a contest. Glossop were awarded a free-kick before Aiden Savory touched the ball on and was caught by Mike Connor who was intending to clear the ball. The referee took his time and then brandished a red card in the direction Connor, much to the home fans’ fury. Tadcaster took control of proceedings and enjoyed plenty of possession, going close came again mid-way through the half when Lawrence Hunter’s cross was glanced just off target by Josh Greening at the near post. It seemed only a matter of time before Taddy broke the deadlock as Phillips’ clearance cannoned into a defender but Murray couldn’t get enough contact on his flick goalwards. Less than a minute later and Phillips was beaten, but Corey Roper’s low drive was a whisker wide of the mark. That man Phillips was in the thick of the action once again just before thebreak, ensuring that the two sides went in level at half-time as he held Corner’s firm strike. Taddy kicked off the second half and continued where they left off in the first as Aiden Savory did superbly to dig out a cross which incidentally flew over the keeper but no yellow shirt was on hand to tap in. It was pretty much a case of attack versus defence for much of the second 45 minutes with towering defender Courtney Meppen-Walter most often the man clearing the danger for the Hillmen, but he almost turned into his own net after Savory headed across goal. Another good chance came and went from the resulting corner, Josh Barrett rising highest only to head narrowly wide. Conor Sellars then tried his luck from a free-kick just outside of the penalty area, but the diminutive midfielder struck the stanchion. Albion continued to knock at the door but their hearts were on their mouths with two minutes to go as substitute Ben Deegan went to ground asking for a penalty, only for the referee to increase his popularity among the home contingent by booking the forward for simulation. Into the last minute of the 90 and and Hunter curled in a superb cross from which Greening’s clever flick was tipped over by Phillips. However, from the resulting corner, Tadcaster struck gold and finally found the back of the net. Having come off the substitutes’ bench, Baker stretched to poke in Sellars’ corner at the back post, sparking a mass pile-on. The late goal secured Albion’s first ever victory at Surrey Street and in addition made it three wins on the bounce for Morton and his players.